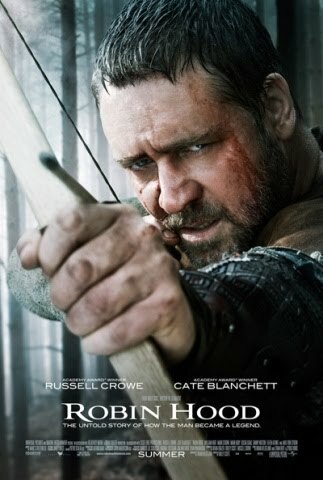 Cast: Russell Crowe, Cate Blanchett, Max von Sydow, William Hurt, Mark Strong. I'm a little late jumping on the 'Robin Hood' review horse and, to be fair, the thing really has bolted by now anyway, but I still think it's worth saying something about this film simply because I feel the criticism it's received has been unkind. It's true that there are problems with 'Robin Hood', I'll grant that. Everything said about Russell Crowe's meandering accent is true and his tones really do take a slow, leisurely tour of the British Isles. One minute the man sounds Irish, then he's a Scot, then he's Northern, then he's just an Aussie with a bow. Believe it or not, this isn't as distracting as you might think (and I'll explain why in a moment). There are also the inevitable factual inaccuracies or historical omissions and, as is always the case, these will grate with those who notice them. On the whole, though, this film only truly flops at one particular point, that being when Russell Crowe bursts out the water, in wholly unnecessary slow-motion, to deliver a particularly poignant piece of dialogue that goes something like "RAAWARRGH" and ends up being accidentally hilarious. But that's it. That's really all the dissatisfaction that I can muster regarding Robin Hood because, on the whole, it's pretty decent and everyone involved can feel safe in the knowledge that there's nothing terribly wrong with being part of a perfectly entertaining film that has far more peaks than troughs. This is a well-paced film that manages to deliver new surprises and add new possibilities to an old legend, and it's this pacing and constant innovation that catches and keeps your interest far more than any dodgy accent or occasional tropes. The plot is somewhat of a wry creation that cleverly ties together a number of different elements and weaves a largely original and mostly cliché-free narrative. Robin Hood is not only an accidental hero who is not who he seems to be, he's also accidentally the decent man that he never intended to be. Crowe is well-suited to being a grouchy and self-interested anti-hero, ultimately more mercenary than menacing, and he's able to makes his character development as interesting as the plot development. Of course, it's a Ridley Scott film, so the production design, sets and general scale of everything are all suitably epic-yet-weatherbeaten. This is a film that's authentic but at the same time not quite as visually splendid as opportunity might afford. Gone, thankfully, are any hints of the CGI that dotted 'Gladiator' and everything is instead presented with a welcome garnish of sweat and mud. Scott always gives us a capable cast too and, as well as the aforementioned Crowe, the performances are strong and the casting apt. So, I don't know why this has been quite the critical bomb that it has. It's definitely not an amazing film, not by any stretch, but if 'Gladiator' was a perfectly decent film that was somehow terribly overrated, 'Robin Hood' is perfectly decent film that has somehow been tarnished by.......well, I don't know what. It's still in cinemas now but if you don't fancy paying full price for admission, it's well worth a future rental. 'Robin Hood' was released in cinemas across the world in May. Unless you're in Japan, where it arrives in December 2010.